Boeing’s (BA) stock closed down 5% on Monday in the aftermath of the second deadly crash of its bestselling 737 MAX 8 jet in five months. All 157 people on board the Ethiopian Airlines flightwere killed when the plane fell out of the sky shortly after takeoff. The stock opened down more than twice as much before recovering throughout the day. The sharp selloff reflected the serious crisis Boeing has on its hands. Almost three-quarters of Boeing’s 2018 deliveries were 737 planes. And Boeing plans to build 59 new 737s each month in 2019. However, US carriers American Airlines (AAL) and Southwest (LUV) expressed confidence in the Boeing jet. 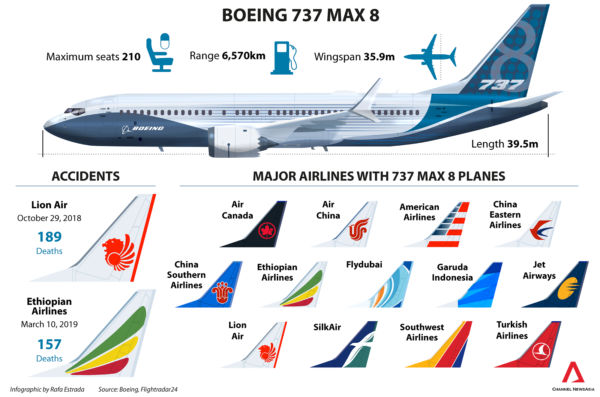 And the US Federal Aviation Administration said Monday that it has deemed 737 MAX planes airworthy, which means it will allow US airlines to continue flying them. Boeing declined as much as 13.5% Monday morning, briefly putting the stock on track for its worst session since September 17, 2001, the first day of trading following the 9/11 terror attacks. The stock’s volatility on Monday played an outsized role dragging down the 30-stock Dow Jones Industrial Average. Boeing is the index’s most expensive stock — and the index is price-weighted. Boeing said in a statement on Sunday that it is “deeply saddened” by the crash and extends its “heartfelt sympathies to the families and loved ones of the passengers and crew on board.” The company said a technical team will be at the crash site to provide assistance. The Boeing selloff may be exaggerated by the fact that the stock had been vastly outperforming the broader market. As of Friday’s close, Boeing was up 44% since Christmas Eve. Spirit AeroSystems (SPR), which makes 737 MAX 8 fuselages, closed down 4%.